One of my favorite things to do when visiting any travel destination is finding fun details which add to the story of the trip. Sometimes I know about the details before I get there like Hidden Mickeys at Walt Disney World. Others I come upon when touring the area. 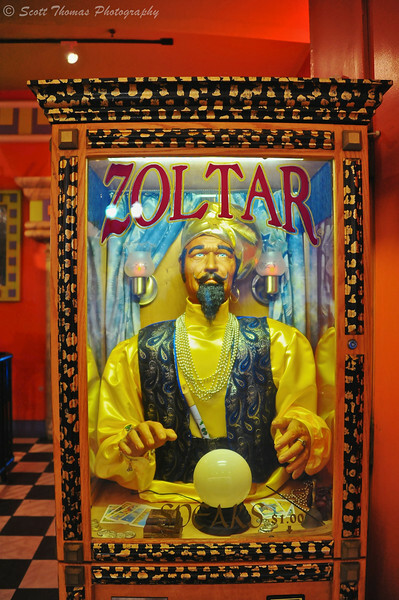 The Zoltar coin operated fortune teller machine is located on the Atlantic City Boardwalk outside of the Ripley’s Believe It or Not Museum. The machine was made famous by actor Tom Hanks in the movie, Big (click here for the video). I was thrilled when I saw this and knew it would add interest to my trip photo gallery. Zoltar coin operated fortune teller machine outside of Ripley’s Believe it or Not Museum on the Atlantic City Boardwalk in New Jersey. Nikon D700/28-300VR, 1/60s, f/3.5, ISO 1800, EV +0.3, 28mm focal length. While getting a campus tour at Florida State University, I was shown Crenshaw Lanes. Being an avid bowler for most of my life, I wanted a photo bringing the sport and the location together. These painted bowling pins on display fit the need perfectly. 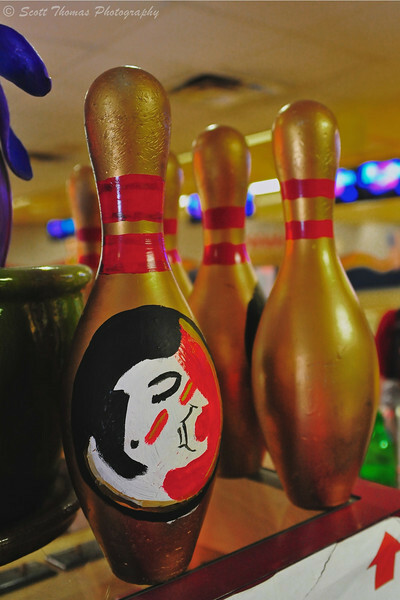 Painted pins found in Crenshaw Lanes on the Florida State University campus in Tallahassee, Florida. Nikon D700/28-300VR, 1/60s, f/3.8, ISO 2200, EV 0, 32mm focal length. Every travel attraction has details. Some famous and some which help you to remember and tell the story of your visit there. Look for them on your next trip across town or across the country. This entry was posted in Photography, Travel and tagged 28-300mm, alley, atlantic city, big, boardwalk, bowling, campus, crenshaw lanes, details, florida, fortune teller, fsu, machine, movie, new jersey, nikon D700, painted, pins, tallahassee, vr, zoltar. Bookmark the permalink.